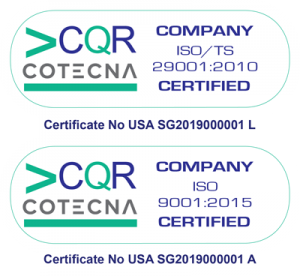 To obtain the ISO 29001 Certificate, all companies must pass the ISO 9001 audit, which grants two (2) certificates. The ISO 29001 standard was developed jointly by the "American Petroleum Institute" API and ISO under the principle of "One Industry, One Single Standard"
ISO 29001 is the quality management system standard that specifically focuses on the supply chain of the Oil and Gas industry. Incorporates the requirements of ISO 9001, an essential aspect for an organizations with a quality system structured for the customer. Analyze and study the customers’ requirements along with their capabilities before acquiring any contractual commitments in order to ensure full compliance with them. Ensures Clients’ requirements compliance by checking the operational process in each of its phases; identifying in a timely manner, potential failures in order to prevent them and ensures full control and compliance of the products and services. One of the fundamental foundation of TEKNACORP’s system of continuous improvement, is the communication with our customers, and within this communication, to receive feedback about our performance and results of the service provided, is highly significant. For this reason, we invite you to evaluate the implementation of our projects and /or raise to our consideration, any comments, complaints or claims if deems appropriate, since we believe these information will be very valuable and will give us elements on the pursue of excellency. 2. Claim and Complaints format.